Levi : How to make a Pan Flute!!!!!! meters down from each other. I keep doing it until the ninth one. Then I get the tape and leave a gap and then tape it and cut it with the scissors. I do that until I reach to the bottom. Then I get the vivid and felts and I do curls. I’ll do whatever design that I wont on the front and back. So now I have nine straws left what do I do with them you think? I make another Pan Flute and tape the straws together. Then I have two Pan Flutes. 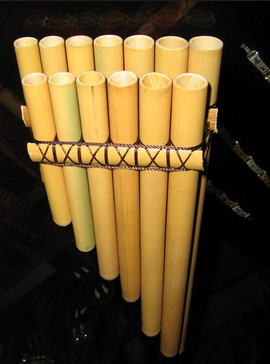 I put them together and it is my one and only double Pan Flute. So when my teacher ask me what have you made and have you copied anyone? I’ll say I have made an instrument and I didn't copy at all. Since it is a class thing that everyone had do. Hopefully no one copied me. Have a great day and comment if you ever get to make your own Instrument. Looking forward to seeing and hearing it.